Do you carry concealed? What things do you think are the most important? I can quickly think of 3 or 4 important things and related mistakes I made when I started carrying, but then my list suddenly began to expand. I ended up with 13 frequent concealed carry (CC) key mistakes I made. Thankfully, I learned from these mistakes, errors, and omissions and maybe you can pick up something from them that may save you some time and maybe your hide. Sometimes things become so routine and obvious to us that we overlook them, neglect them, or don’t focus on them because they are so familiar. Here are my basic CC mistakes and things I focus on, to help you not make the same ones. So benefit from my errors and mistakes on this list, so you can be more effective and safe when you CC. Carrying a firearm brings a lot of responsibility before and accountability after a deadly force shooting, so having a proper CC Mindset is extremely important. By “Mindset,” I mean an established set of beliefs and attitudes that orients the way we individually behave and handle situations and problems. Those who carry must go out of their way to initially avoid conflict and confrontations. To me, a CC mindset means that we must be disciplined with a controlled and mellow easy-going attitude. Most of us know that we have the gun skills and are motivated to protect ourselves and our families just in case trouble arises. 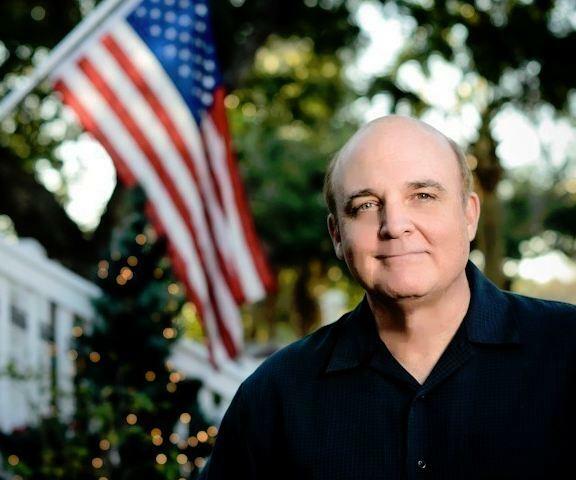 We are prepared to respond in a deadly-force encounter, if the situation requires it. Certainly, we want to accept personal responsibility and take necessary action to protect ourselves and our loved ones. If possible to do so safely, we must accept that we probably should leave the problem situation to avoid a deadly confrontation. Of course, each situation is different and many existing factors must be individually considered. Escaping , retreating, and avoiding a confrontation does not make you a wimp, a wussie, ineffectual, overly fearful, or a pansy! This is not a sign of weakness, cowardness, or lack of skills, but rather recognition of the many varying factors that must be considered and our long-term priority to protect our lives and those of our loved ones. Even the 5th Century B.C. book “Art of War” by the respected Chinese General Sun Tzu gives strategic rules for making decisions in various situations and particular tactical responses for each, including retreating and avoiding engagements, for a long-term win result. Sometimes you can “win” by retreating and avoiding a confrontation. The best way to “win” a gunfight is to avoid it all together. Just because we can legally carry a concealed weapon does not make us police officers nor vigilantes. We should not have a macho, emotional, impulsive, or revenge-kill instinctive reaction, but rather avoid trouble, use non-emotional and rational judgment, and de-escalate confrontations. We should make every effort to not get into fist fights when we are carrying and recognize that any time a gun is introduced into a situation, it escalates it and nothing good will result. Even though the attacker is an obnoxious, contemptible, and “bad” person and probably does need to be dealt with, usually more negative things will result and it can be very costly for you in many ways, if you first aggressively introduce a gun. Not just negative financial consequences, by the way. You bear the burden of proof for every bullet that leaves the muzzle of your gun in self defense! The use of lethal force is always the last option. Think about it. Being armed and prepared is more than just the possession of the firearm. You must understand the reality of the situation and control your mind. The GUN is only a tool. The MIND is the true weapon. Your training should be comprehensive and include certain key topics, fundamentals, techniques, and safety. And they should be current and related to realistic CC situations you might actually encounter. CC Training must include not only Marksmanship and proper gun handling, but also LEGAL and MORAL aspects of using a gun in self defense. If the training you receive and the drills and repetitions you do in your practice are incorrect, outdated, and/or incomplete, you will not be properly prepared and will train the poor technique or incorrect fundamental into your subconscious memory and then rely on it in an encounter. Avoid an abbreviated, one-round fired into the barrel at a gun-show, 45-minutes, or “quickie course”. You are harming yourself (and others) by getting minimal training that often overlooks several fundamentals and techniques necessary to protect your life and your loved ones. Frequently in fundamentals training there is minimal range hands-on firing without personal guidance nor private, customized instruction to improve your current skill set. Continued education and training in and beyond the basic fundamentals are both very important. Also, just because 5 years ago or so you received a solid basics course, techniques and methods improve and change, so you can learn something by attending a new fundamentals course as a refresher and update. Find Pew Pew Tactical’s reviews of some Online & In-Person Training Solutions. Recognize that just because you have had training in rifles and shotguns, there are key differences between those long guns and handguns. Annually scheduling update refresher and key topics training will better prepare you to respond automatically with the proper Muscle Memory. Depending upon the complexity of the task, the dexterity of the individual, the situation, and other factors, it may require 1,500 to 10,000 repetitions of an action for success as an automatic, conditioned response from Muscle Memory in the brain’s cerebellum. Malcolm Gladwell says in his book “Outliers” that 10,000 hours of practice for a task results in success. Some say realistically it takes 3,000 to 5,000 repetitions of an action or behavior for it to be engrained as an automatic long-term motor skill response. So it varies quite a lot, but still repetitive practice is the key. Long-Term Cerebellum Motor Skills (Muscle Memory) Become Fine-Tuned with Repetitive Practice. Do not neglect practicing such topics as recognizing and solving gun malfunctions and stoppages, proper draw and presentation technique, trigger control for accuracy and speed, reading your state’s CC laws, proper use of cover and concealment, shooting on the move AND standing still, shooting with weak hand AND strong hand only, shooting multiple threats/targets, low or no light threat engagement, use of tactical flashlight, gunshot wound/trauma first aid, reloading under fire/stress, scan and access reinforcement, etc. You must know for your state or jurisdiction legally when you can and cannot shoot, when you can use deadly force, where you can and cannot carry concealed, if brandishing and printing are permissible and/or when appropriate, if you are required to show your CC license/permit when stopped routinely by a police officer, how to recognize disparate force factors, what are the details of your area’s Stand Your Ground and Castle Doctrine laws, what are your state’s reciprocity states, how to relate to the police if there is a shooting, and what to do after a shooting, etc. A lot to know. Regularly seek out current handgun LAWS and requirements for your state and jurisdiction from a competent source. Check out Pew Pew Tactical’s Concealed Carry Laws by State resource. There are many reasons for someone not to carry their CC gun daily, after they took the time, effort, and expense to get a CC license/permit. Why do some not carry all the time and only sporadically every now and then? I use to make this mistake. You never know when you will need your CC gun for an unexpected deadly-force encounter, so don’t risk it. We should carry all the time, if we are legally-licensed to do so. I recently had some out-of-state students in our CC class from states where they can’t get a permit to carry or it takes 1-2 years to do so. They wanted an out-of-state permit for when they travel and they recognize the importance of carrying all the time. Some don’t carry because there is a chance of legal problems when they transport their guns to certain places or when they travel in several restricted states. Some live where they can carry, but work in another state where they can’t. But by far the reason for not carrying daily for some is to carry only when they are exposed to a high-threat level or feel endangered, even though we should avoid dangerous places, people, and situations. Today, ANYPLACE and ANY SITUATION has the potential to escalate and be DANGEROUS, including (as we know from recent tragic events) schools, malls, churches, music concerts, birthday parties, all neighborhoods, etc. Another reason I hear frequently is that it is uncomfortable to carry the gun. The holster is rubbing my side; the gun doesn’t fit right in the holster; the gun won’t fit and conceal properly under my t-shirt or with shorts; the belt won’t support it well enough; my tummy roll is a problem; etc. If the gun is too heavy, too long, too wide, has too much recoil, doesn’t fit right; or if your holster, belt, or carry method is not correct or cumbersome… CHANGE them. Some gun with you is better than the gun left at home, in the safe, or in the car. Find the best gun, holster, belt, carry rig combination that works best for yourself and carry it always. Carry with a round in the chamber with safety engaged and be disciplined with the proper training to NOT put your finger on the trigger until you have your eyes and sights on the target and you are ready to shoot. You will never know when that fateful encounter might occur; be prepared just in case. 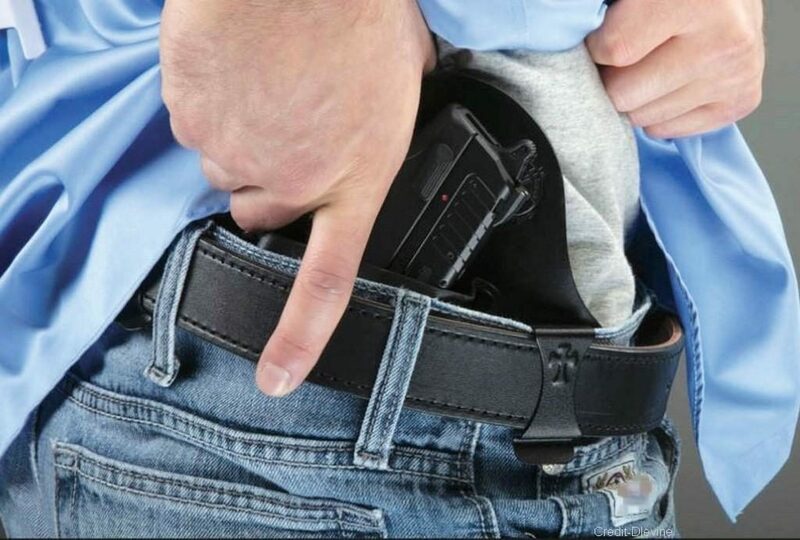 When I started carrying concealed, I was very conscious about where my gun was riding, if my shirt was properly covering it, if my pants were too tight to reveal the gun’s outline, if my fat paunch accented my gun, etc. You can draw more attention to yourself and your concealed gun by touching, checking, and adjusting it often. I looked suspicious when I constantly tugged and adjusted my shirt. So, I calmed down, relaxed, did not touch and adjust my gun, and truly realized the value of a good holster, belt, cover garment, and proper clothing. With my horizontally-challenged build, I could no longer wear tight clothes and form-fitting, light-colored smaller t-shirts, pants, and sweaters. I had to buy my pants a size larger for in-the-waistband carry, accept a somewhat baggy appearance, and I had to wear dark clothes. I got use to it and accepted that most would not even see my concealed gun and were not even looking for it. So what if they did accidentally see it. It is just my PDA, cell phone, tablet, or medical device. Without any doubt, it is important to train and practice with the gun and ammo you will carry. The techniques and fundamental actions that you routinely and unconsciously perform in training and practice do influence your performance in actual self-defense and combat encounters. If you are not closely familiar with your gun, holster, ammo, and other accessories, how will you be able to operate and handle them successfully, smoothly, efficiently, and accurately in an emergency encounter? You should Drill and Practice regularly with your carry GUN, AMMO, carry garment, and equipment. Make deployment of your CC gun second-nature and a comfortable habit. While practicing, some shooters fail to use their hollow point (HP) or self-defense ammo they actually carry. Usually they cite the higher cost of the HP ammo. To better acquaint yourself with the performance and characteristics of your self-defense ammo, practice with it occasionally, perhaps once a month or so. You can mostly practice with your full-metal jacket ammo for cost savings, but still practice sometimes with your HP ammo. Your CC gun will handle HP ammo differently than it handles FMJ and other rounds, so practice with BOTH JHP and FMJ ammo. Check out Pew Pew Tactical’s Picks for HP ammo for a variety of calibers in their Ammo & Reloading resource. The CC gun you carry everyday is going to be a COMPROMISE. You probably will realize that the gun you want to carry and the gun you will have to carry may be different. Larger guns in calibers that are generally considered to be more capable may also be more difficult to conceal, heavier with more bulk, and may require more practice for optimal accuracy. However, you also need to understand that concealment is usually more a matter of holster design and cover garments than gun size. It is your responsibility to weigh the several personal considerations, decide, and select the “best” gun and ammo for yourself. Generally, Width of the gun and the Height of the gun (not so much barrel length) are key specifications for determining Concealability. Try a gun before you buy it and before an actual violent encounter. For example, we offer a special range session where shooters can select three of our 150 handguns with provided ammo for a modest fee, so they can select their optimal CC gun from their 3 best choices, by actually handling and shooting them. It is important to use a quality-made custom holster from a reputable and proven manufacturer that is designed specifically for your carry gun, if you carry with a holster. I learned this lesson the hard way and now have 3 boxes of holsters. I do not use many of them. What GUN is going to be your primary concealed Every Day Carry (EDC) gun? What METHOD of CC are you going to primarily use? Do you want to have 2 or 3 CC methods and a best HOLSTER for each way of carrying? Is In-the-Waistband (IWB), Outside-the-Waistband (OWB), or another going to be your primary CC method? What “can’t live without” features do you PREFER in your CC holster? What specific CRITERIA do you use for comparing holsters and then selecting your best CC holster? How do you RANK in importance your preferences and criteria when evaluating any holster? Where does COST fit into your CC objective and how much are you willing to spend to protect your life? Yes, you can keep your gun in a nylon holster when it’s in the range bag, but use a quality, custom-fit holster for your carry gun. This applies to carry by any method, e.g. IWB, OWB, appendix, ankle, shoulder, pocket, small of back, fanny pack, day planner, purse, bra, etc. A holster or carry device custom made for your gun model will usually allow you to draw and secure your gun better, as well as help to make it more concealable and accessible. A customized holster for your specific gun model will completely cover and protect the trigger from contact with outside objects, including your trigger finger. A properly-designed holster made specifically for your gun will retain the gun until you intentionally draw it. Do not expect a $15. holster on sale for $10. to provide a reliable and comfortable carry solution for your $700. carry handgun. A very rough rule of thumb is to expect to spend about 10-15 percent of the cost of your handgun to purchase a reliable, safe, comfortable, and effective holster. Proper IWB holsters are usually more concealable, but also may be less comfortable. But they may also require a trouser and belt size adjustment to compensate for the added bulk. 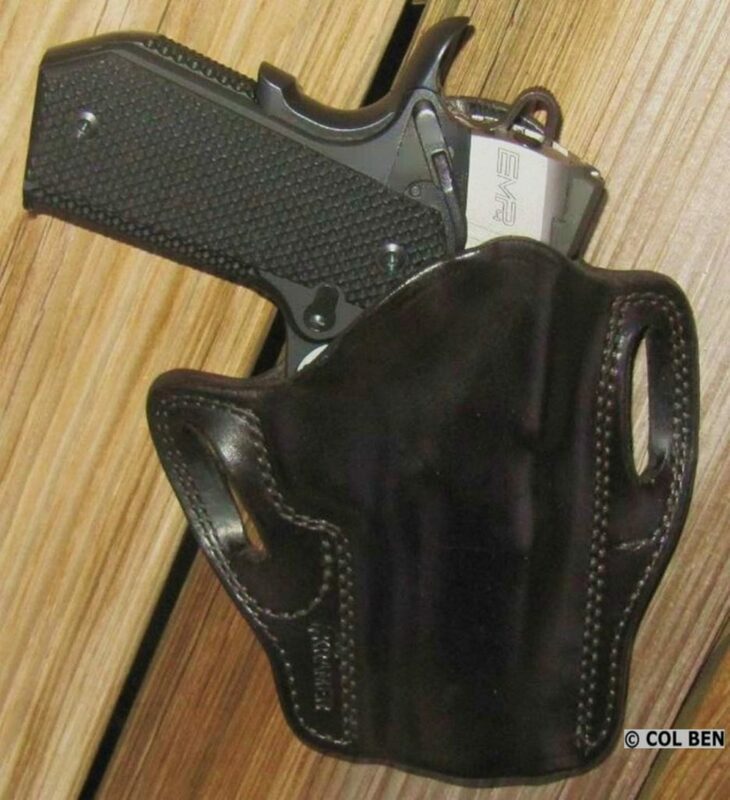 An OWB holster is usually more comfortable, but also usually more difficult to conceal. You can make your carry gun very concealable, but sometimes at the cost of a much slower access and draw. Or you can have a faster access and draw, but with less concealability, giving up a major tactical advantage. A very personal decision. Check out Pew Pew Tactical’s picks for the Best Concealed Carry Holster. A gun belt is extremely important to properly support your handgun, especially when drawing and re-holstering it. Some believe a Gun Belt is just as important as the gun’s holster. Others say at least as important as the holster. In any event, a gun belt is a “must-have” accessory for your handgun rig. You need the support for your gun and accessibility that you can count on. A rigid high-quality full-grain bull hide leather gun belt will help minimize movement of your gun, be strong and resilient for long-lasting durability, help distribute weight, and add to comfort. A leather belt that has been reinforced with an inner layer of kydex will be rigid and help it from deforming, rolling up, and sagging. Price is usually an indicator of quality, so spend the money to get a good gun belt, rather than the $15. for the discount store flimsy belt. Check out Pew Pew Tactical’s Guide to Concealed Carry Belts. The CLIMATE, your job, lifestyle, daily activities, and your location where you live have a significant affect on your CC clothing. In some areas, you may carry the same way all year long, while in other locations, you may wear shorts and t-shirts in the summer and heavy coats and gloves in the winter. These differences can be frustrating and challenging, but you must adapt. For example, a plain white dress shirt is usually plenty of concealment if you’ve got an IWB holster. A loose untucked casual shirt, like a guayabera, Hawaiian or camp shirt can easily hide the grip of a handgun from the casual observer. A sweatshirt or hoodie add bulk around the waist that probably can hide most large handguns. I find as a horizontally-challenged geezer in my very warm Florida weather that wearing loose and baggy clothing and over-sized, untucked casual shirts make CC easier, but not so stylish. I live with it. Your GUN’S DIMENSIONS, features and size, and your BODY build are key factors affecting garment selection. Sometimes I switch from OWB carry to IWB carry and it seems to conceal some of my smaller guns better. Another option (so at least you will carry something) is to consider carrying one of the smaller subcompact handguns recently released, be it one of the new .380s or 9mms. Now there are many lightweight, ergonomically-rounded, reduced-snag polymer-framed pistols and revolvers made especially for carry. Of course, if you live in one of the 45 or so open-carry states (not Florida), you should carry with adequate retention to prevent a gun grab. With CC being legal now in all 50 states, open carry may not be your personal choice because of the negative reactions and possible problems with other folks (and maybe the police) to seeing a gun openly displayed and the disadvantage of not having your gun hidden. Of course, this is a very personal choice depending on your preferences, comfort level, and clothing choices, etc. Whether you change your method of carry for one day or the entire season, remember the importance of being familiar with your carry method. Some CC methods require you to access and get past clothing used as cover, which makes drawing more difficult and time consuming. Practice is key for you to be able to deal with your clothing as cover, draw properly, etc. in stressful encounters. Whether you know and practice Cooper’s 4 Color Codes of Awareness or Boyd’s OODA Loop, or the NRA’s Unaware-Aware-Alert-Alarm cycle, situational awareness (SA) is of critical importance for everyone at all times. We should be cautious, practice observation, scan and assess our particular environment, and know the variables at play in each situation we encounter, even though it is very difficult to do so. SA is simply knowing what’s going on AROUND YOU and knowing your SURROUNDINGS. It sounds easy in principle, but in reality SA requires much practice and keen observation skills and focus. This is challenging in a stressful encounter or even in non-threatening environment. We tend to “behave in a way that makes sense to OURSELVES” and unwittingly NEGLECT other things. Our reality is based on our delimited set of experiences and relative knowledge. It makes “sense” to us because of particular unique experiences, controllable and uncontrollable factors, some we may not be aware of. Research shows that when we get nervous or stressed, our attention and focus narrows, causing us to concentrate on just a few things at a time. A narrow focus can therefore cause us to miss important threats and details in our environment. While SA is taught to military personnel, law enforcement officers, and others, it is an important skill for everyone to learn as well. It takes focus and concentration with a big picture, total system perspective. In a dangerous situation, being aware of a threat even seconds before everyone else can keep you and your loved ones safe. Knowing where your external safety, magazine release, slide lock lever, and controls are located and how to operate them efficiently as if they are an appendage to your hand, might save your life because of your immediate muscle-memory reaction in a crisis. You must correctly train and practice to develop proper long-term motor skills. 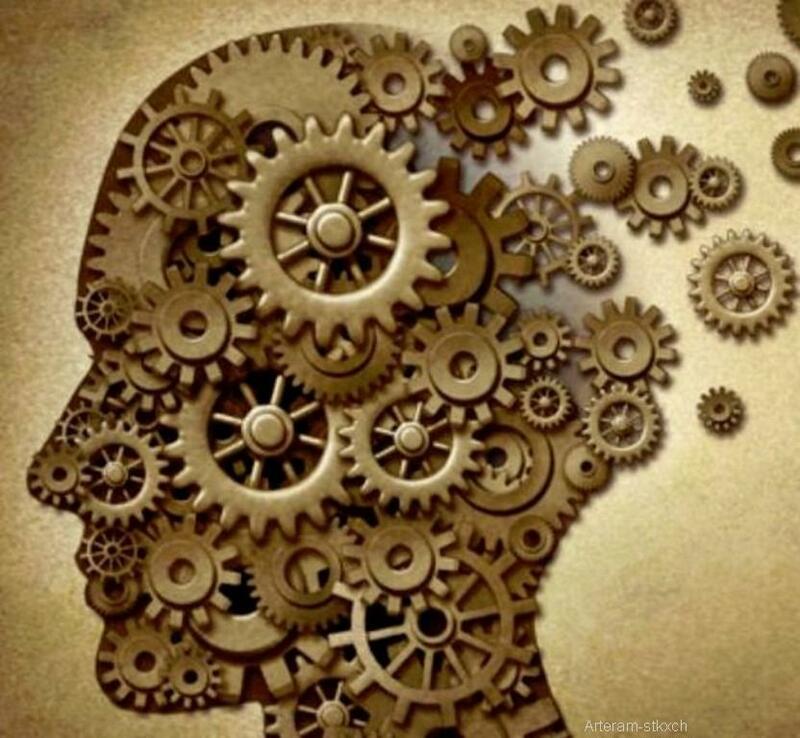 As noted above, most agree that it takes approximately 3,000 to 5,000 repetitions of the same motor skill to develop and instill a long-term automatic muscle-memory response, as a subconscious reaction to an external stimuli. A few say 8,000 to 10,000 repetitions of practice make for success. So practice is certainly key, like riding my bike, typing on a keyboard, playing my saxophone, or my handgun trigger control. But practice the PROPER techniques and fundamentals. If a specific shooting skill or technique is at first performed wrong and subsequently allowed to continue to repeat, with the mistakes intact, then unfortunately the muscle memories created for how you complete the task will also be flawed, on a subconscious level. So when beginning to learn a new shooting skill or technique, it is best to take it slow and pay close attention to what and how you are performing the actions. Ensure that the handgun Motor Skills being practiced and repeated are technically CORRECT, so incorrect skills are not repeated, committed to muscle memory, and proper skills must be relearned. Develop the correct muscle memory training. Know how to operate and use your handgun and train accordingly, so you do not learn incorrect motor skills. It is an understatement to simply say “thoroughly know your CC gun and ammo.” Take time to regularly practice with your CC gun and use your personal-protection (e.g. Hollow Point) ammo to practice with occasionally. Different ammo performs differently in the same gun. Regularly maintain and clean your CC gun. Honestly, I clean my gun after EVERY use, even if only shooting a box of 50 rounds. This may be an overkill for some, but I have the peace of mind of knowing my CC gun is always in a top state of readiness and will not let me down because of a cleaning or maintenance issue. Even if I do not shoot a gun, I try to inspect it, perform a function check, and clean it about every four to six months. I believe AFTER EVERY USE you should CLEAN and MAINTAIN your CC gun. Also, regularly INSPECT and FUNCTION CHECK it. Check out Pew Pew Tactical’s Guide to Cleaning & Lubricating a Firearm. Begin your CC training by analyzing your present shooting skills and where you need improvement. It is imperative to build positive and useful training and practice habits early. Not just shoot randomly at paper. I believe shooters should review their training progress and skill areas on an annual basis and then design a practice plan with specific drills to help improve deficient identified skills or areas needing improvement. There is always something to learn or improve upon. My book has several fundamental skill drills to help. Shooting fundamentals and skills are PERISHABLE and they deteriorate if not practiced. So, you must practice on a regular basis. Every year I try to complete at least one training course for improvement in a skill area. Practice is critical, but so is how you practice. Do not just shoot holes in paper. Have a planned course of fire and focus on Specific DRILLS for key fundamentals and areas where you need improvement. Snap Caps and Dry Firing can be very helpful. Snap caps have a spring-damped false primer or one of plastic that cushions and protects the firing pin for many repeated strikes and protects your gun’s components. They can be used at home since they are inert without gun powder, inexpensive, can be used many times, and you can use them for practicing loading, unloading, handling malfunctions, misfires, jams, racking the slide, ejecting rounds, proper trigger techniques, and other fundamentals. Dry Firing is practicing at home with snap caps and an UNLOADED gun. If you cannot get to the range regularly, then use inert snap caps to practice in the comfort of your home. While dry firing, you can practice aiming, sight alignment, sight picture, stance, grip, trigger control, follow through, loading and unloading, clearing malfunctions, and drawing to build muscle memory. Recognize that while dry-fire practice drills with snap caps are useful, there is no substitute for range fire with live ammo. Check out Pew Pew Tactical’s Guide to How to Shoot More Accurately. And also the Best Laser Cartridge & Targets for a more hi-tech training scenario. If you cannot devote some time on a regular basis to shooting practice, your shooting skills and performance under the stress of a deadly-force encounter will suffer. Regular live-fire practice definitely helps. 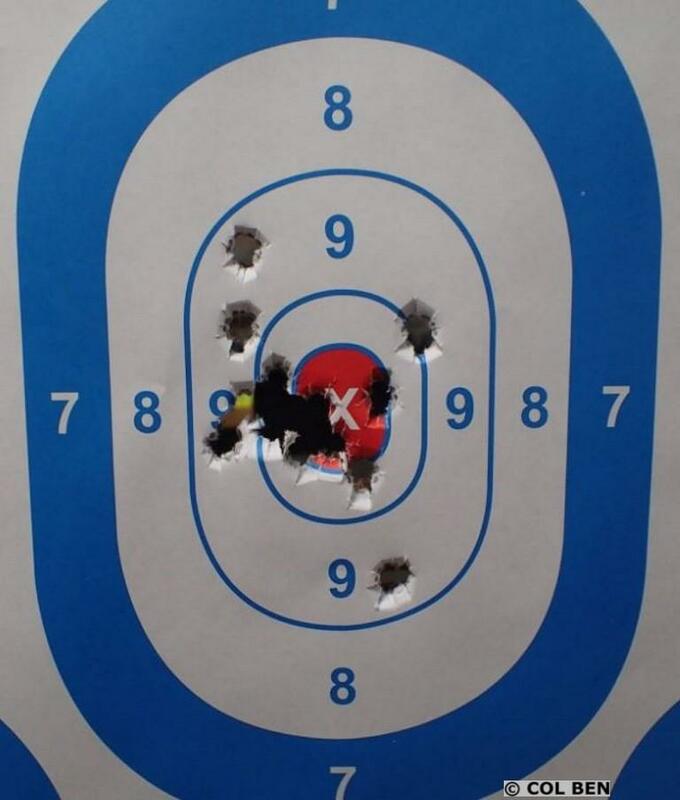 Try to plan for a monthly Range shooting session, but go at least every 7 to 8 weeks as a minimum. You can practice dry firing as a supplement in your home about once a week. Be prepared, since violent encounters occur at what seems like the speed of light. Continued success! And be sure to check out Pew Pew Tactical’s Concealed Carry resource for more tips. Photos by author and as credited. 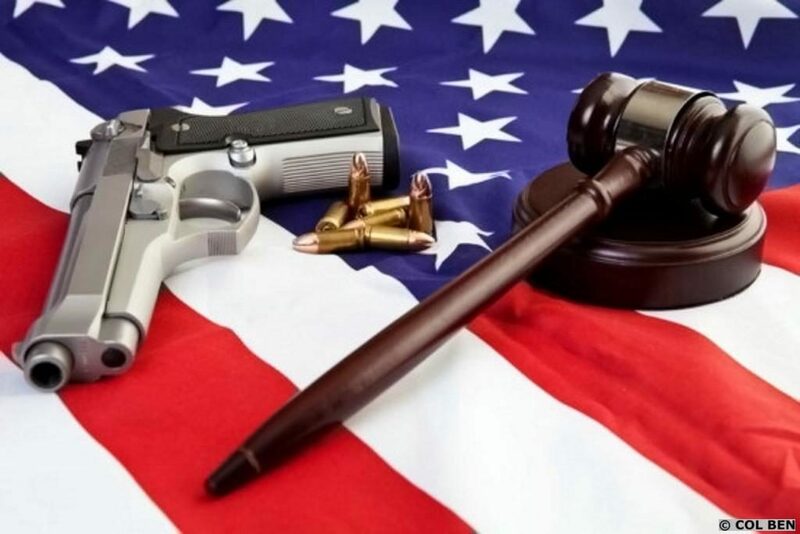 Disclaimer: This personal opinion article is meant for general information & educational purposes only & the author strongly recommends that you seek counsel from an attorney in your state or jurisdiction for legal advice & your own personal certified weapons trainer for proper guidance about shooting & using YOUR firearms, self-defense, stand your ground law, & concealed carry. This is not legal advice & not legal opinions. It should not be relied upon as accurate for all shooters & the author assumes no responsibility for anyone’s use of the information & shall not be liable for any improper or incorrect use of the information or any damages or injuries incurred whatsoever. Safety First! Any advice on carrying an extra magazine or two? Fantastic article. I plan to print it and reread it on occasion. One drill I like to do is load your magazine with a fired case so you get either a misfeed or click. Makes you quickly assess the situation perform immediate action and get back on target. For extra fun have your shooting buddy load it so you don’t know where it is. I do this as well, but instead of an spent case, I use a snap cap. I’ve also found that in the event my shooting buddy is unavailable, I load multiple mags at once with the snap cap in a different place in each mag to randomize my training. You can also simulate failure to feed problems by loading a snap cap in the mag backwards. This should be added to every handout packet of every CCW course. I’m doing it with mine. Excellent article.